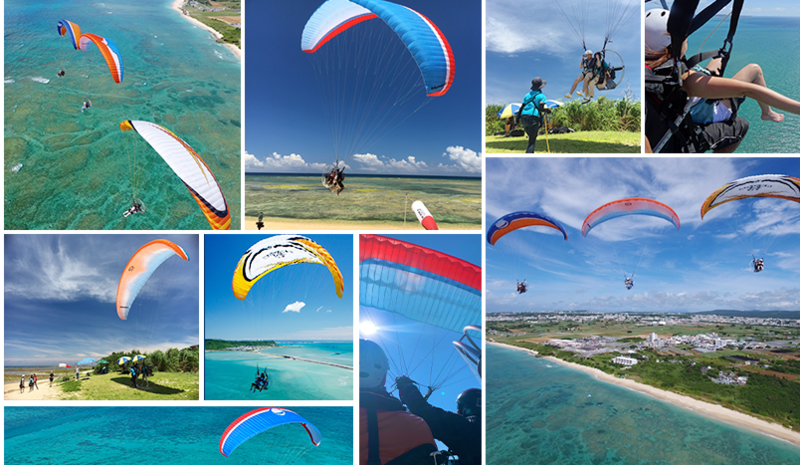 Flying from the beaches over the Okinawa's blue ocean with great attention to safety, and with the support of qualified staff. 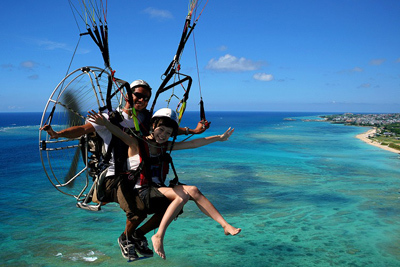 We usually fly up to 200 meters (656ft) but you can choose as high as you would like to go. Also children( 3 years old) and beginners are very welcome to take part in. We have an experienced instructor to guide you. We recommend you to bring your camera! You'll be able to take a superb view while you enjoy traveling through the sky. 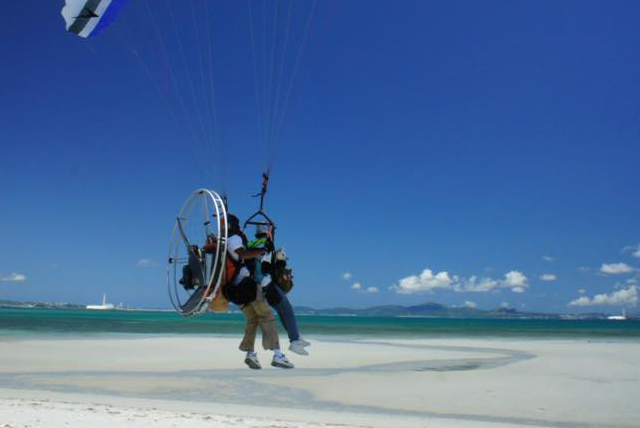 The flight location will change every day due to the wind conditions. Please feel free to ask us to confirm the location and weather before coming. *The weight limit is 175lbs maximum. Guests who pregnancy and serious disease may not participate in this activity. Keep moving forward with your pilot until take-off. Try to take a picture or movie of superb view! 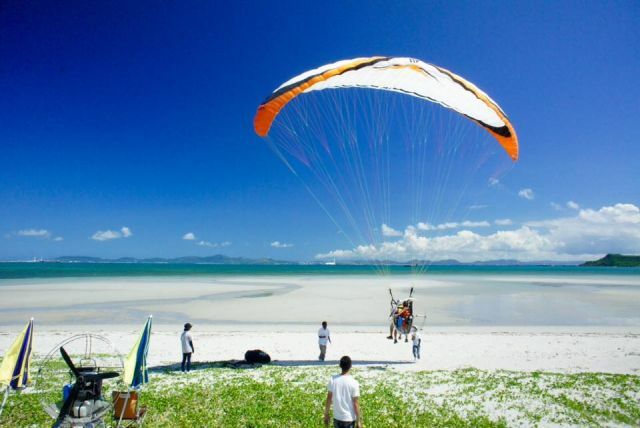 さあ、着陸の準備です！ Land on the beach! Get ready to stand up on the ground. QDo I need a reservation? Depends on the wind conditions for that particular day. 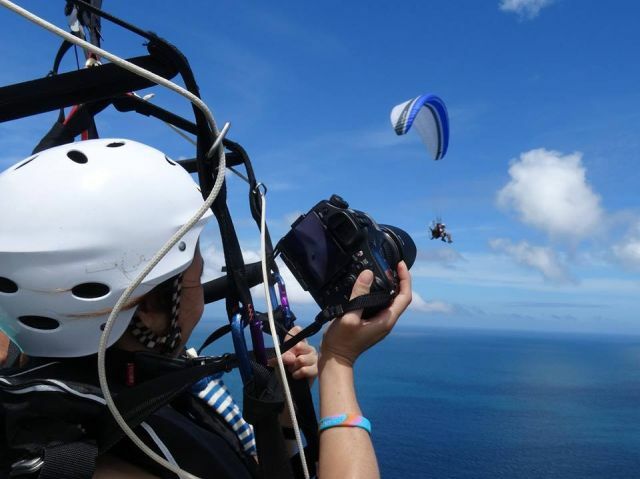 Wind conditions are checked that morning and the flying location will be decided about 9:00am. Dress according to the weather but you can wear what you would normally wear to the beach in windy/sandy conditions. Women should wear pants, please. QDo I need a bathing suit? QIs there a weight limit? The weight limit is from 15Kg to 80Kg (30 lbs to 175 lbs). QIs there an age limit? QHow much time is required? Flight time is 10 minutes, preparation time is about 5 minutes. QHow high do you go? Up to 200 meters, then glide down silently with the engine off. QCan I carry a Camera during flight? QCan two people fly at the same time? Yes. 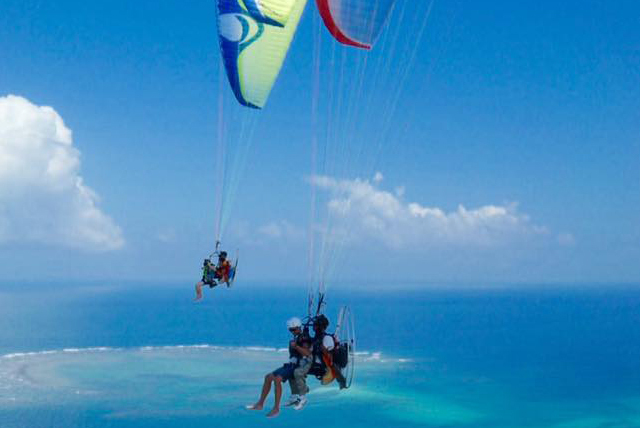 Two people will use two gliders piloted by two pilots. Both pilots will launch at the same time or shortly after one another and can fly side by side. Yes and usually free however, some flying locations will require a small fee. QIs there any cancellation charges? We will automatically reply to the e-mail address of your application. If you do not receive the e-mail, please do not hesitate to contact us, ok_bluesky@yahoo.co.jp. After applying, we will confirm availability here and will contact you soon. Copyright © Blue sky Sky Sports Planning. All Rights Reserved.